Green, arguably the most restful colour on the colour wheel, when used to complement other calming colours like light grey and soft white, can help create a place of rest and tranquillity in the home. Even if you’re not wanting to splash any pops of green in your interiors, simply by installing extra windows that overlook your garden or adding a beautiful pair of French doors, can bring in the shade in a non-confronting yet powerful way. This also gives your home more natural sunlight which will give the appearance of appearing larger, particularly handy if you have a smaller living space. With so many verdant shades and tints, using green for an accent wall can add some sophistication and create much needed depth in a room. When teamed up with white, black and grey for the surrounding interiors, a green accent wall is a stunning focal point of the bathroom provided it’s placed underneath a skylight or window so that the room does not become too dark and confined. Shimmering mosaic style tiles with a green tone running through them is also perfect for a splashback and for creating some interest in a bathroom that is mostly white. If you’re not keen to use green in large doses, thankfully there are options to add a bit of colour without going too overboard. Throw pillows or rugs are excellent choices if you want to change things up in the living room. This is where it pays to choose neutral palette for living room or dining furniture, so you can easily accessorise to bring a burst of freshness. 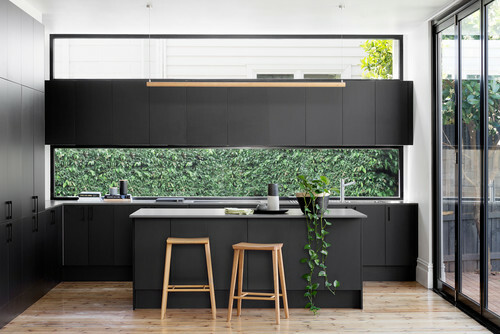 The same principle applies for other rooms in the house like the kitchen, where a green splashback paired with natural timbers and a black backdrop can have a dramatic effect while still retaining a clean look and feel. Such an easy addition to any room, plants and greenery are becoming common staples in many homes. We know that plants can improve air circulation, but did you know they can also help reduce noise? One plant for every 100 square feet of space is all it takes to muffle noise and make your home a more peaceful and quiet place. If you’re not a confident gardener there are still many indoor plants, you can choose from that don’t require much maintenance. Our favourites are succulents, with many capable of living in harsh climates, they don’t require much water to keep looking fresh and alive. They can also be potted in many unique ways, like used in a terrarium to create a mini-ecosystem- pleasant to look at and easy for the upkeep. 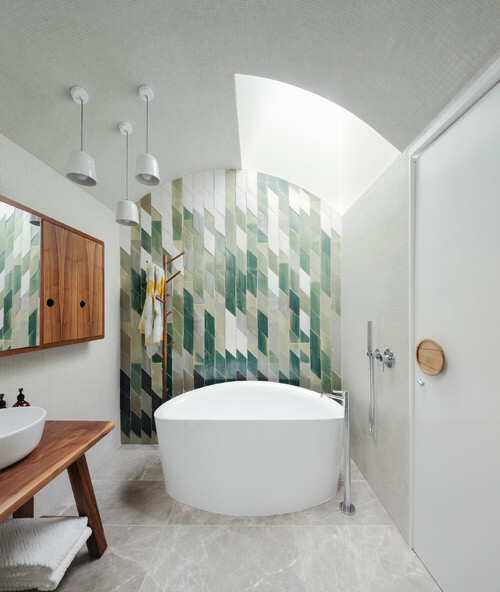 Tying in again with the nature theme, it is easy to see why green tiles are a constant source of inspiration on Pinterest, with its ability to effortlessly complement timber, stainless steel and white ceramics. Nothing achieves a more serene and relaxing atmosphere in the bathroom than mixtures textures with a cool blue-green hue- the ultimate destressing colour. 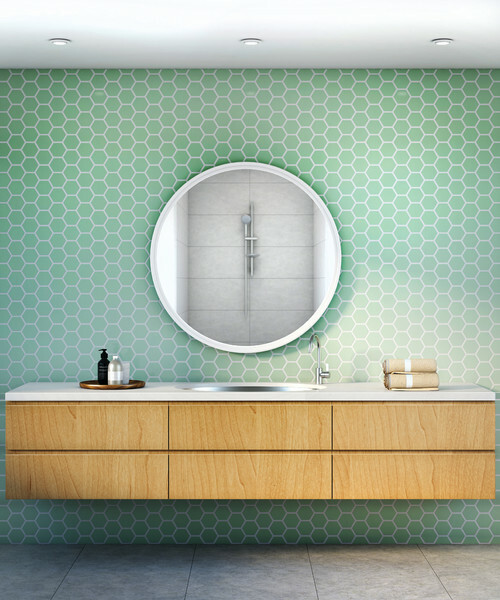 A sea green glass tile is growing in popularity and against a natural wood wall-mount counter can transform your bathroom into a spa-like haven. Wanting to add some green accents to your home interior? Nu-Look would love to catch up and discuss how you can use this colour as part of your home renovations to achieve a stylish and striking look.